Last night my husband, Steve, and I were exchanging ideas for Halloween costumes and I suggested one Photo by Mark Grapengater(sorry, costumes are top secret) that completely hit my funny bone and I could not stop laughing. I was crying, my head was in my hands, and my whole body was shaking.. IT FELT SO GOOD! It's no wonder that it felt so good since laughter is one of the best drugs around - seriously. Laughter - even the anticipation of laughter - changes our body's chemistry by reducing stress hormones and kicking up endorphins (the brain chemical that feels so good). The other cool thing is that laughter helps us bond and create stronger connections as humans. Just Google “Health and Laughter” or check out this NY Times article and see all of the benefits of a good hearty chuckle. The long-term effects? Overall better physical and mental health, plus it’s great for your relationships. Besides the fact that it just feels so darn good, the health benefits are a reason why I have a daily laugh quota. Okay, I don't actually count the number of times that I laugh, but I have an internal laugh scale and know whether or not I've laughed enough in one day. In order to meet this "laugh quota" I do one key thing: I purposefully add laughter to my day. One of the easiest ways I've found to add a few giggles is by watching Ellen. The show cracks me up, but on top of that I’ve noticed that once I start laughing in a day I’m more likely to continue laughing. I’ll share jokes over dinner. I’ll seek out funny shows or articles. I'll bust up over a Halloween costume suggestion! 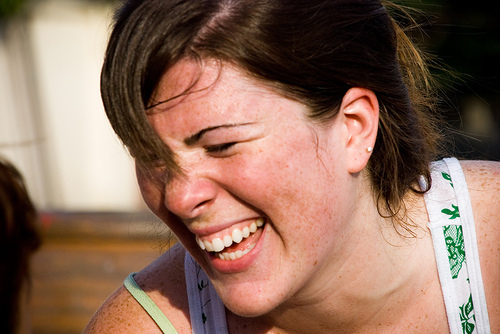 Laughter leads to more laughter and, as we all know, laughter is contagious. How much have you laughed today? 1) Find something funny: Find your “Ellen” show, look up YouTube videos, or read a funny blog every day. 2) Hang out with laughers: This is one of my favorites. I have a few friends that I know I will laugh with whenever we get together. Invite some funny people over for dinner. 3) Laugh at yourself: We’re all funny, even if you take yourself really seriously – that’s funny. So, in celebration of laughter, health and Halloween, here is a clip from the Ellen show last year that STILL cracks me up every time I watch it. Warning: It's good if your sense of humor is one that finds it hilarious to see people scared.